The plaque on the organ, of 1857, names the builder as Charles Brindley. As a new organ builder, St. Mary’s was one of the first organs he completed. The middle of the Nineteenth Century was, as now, a period of tremendous change and development. The railway network was branching out over the countryside, and came to Doncaster in 1848. The Great Exhibition of 1851 was a showcase of talent. One of the exhibits there was an instrument made by a German organ builder, one Edmund Schulze. 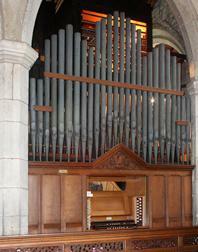 Prior to the Great Exhibition the English Church Organ was a small affair compared with its European counterpart. At Tickhill there had been a ‘finger’ organ since 1831. This, in its turn, had replaced the minstrels who led the worship from a gallery situated at the West End of the church. Few organs in the English Parish Church in the mid Nineteenth Century could cope with the great European tradition of organ music (the Bachs and Buxtehude). It must have been clear to Edmund Schulze soon after his arrival in England in 1851 that in the instrument he brought to the Great Exhibition he had something new to offer. Enter Charles Brindley. Charles Brindley had been trained in the family business of installing domestic call bell systems in large houses. The method of operating these systems was an action consisting of wires and levers, a type of mechanical or tracker action not dissimilar to an action used in organ movements. It seems likely that Brindley met Schulze at the Great Exhibition. He certainly went to Paulinzelle in Germany to learn the art of organ building. Especially the flute pipes (in German called Hohlflote, Gedackt of Rohrflote) took on a new sound with German scale and voicing techniques. 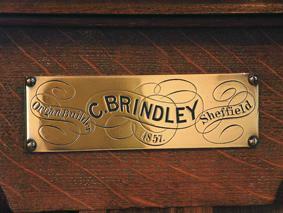 Brindley began his own organ building business in Carver Street, Sheffield on January 1st 1854. St. Mary’s specification shows the Schulze influence. For the first time in the English Church organ we see a complete Diapason chorus from 8 ft to 4 rank Mixture. 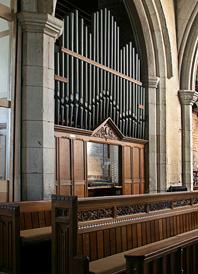 An earlier commission for Brindley was for a temporary organ for the Parish Church at Doncaster. The medieval church was destroyed by fire at the end of February 1853. Plans were soon made for a three manual (keyboard) organ to be made, accompanying first the services held in the Grammar School (Thorne Road) and then rebuilt in the church for its re-dedication in October 1858. After the completion of the five manual instrument by Edmund Schulze at St. George’s in 1862, the Brindley organ was sold to the newly built St. James Church. Following the success of the Doncaster organ Brindley was asked to build an organ for Tickhill. Although remedial work has been done on the action, blower and console, the original pipework still sounds week by week. 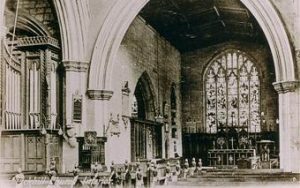 In the early years the organ was sited at the West End of the church. The church was used to its services being accompanied from this position. Being under the tower also offers the most resonance in the building. With the introduction of a robed choir and the greater emphasis upon the liturgy in the Chancel it was decided to move the organ into the North Chapel. A plaque indicates permission having been given for the use of this chapel, (the then Laughton Chapel), for resiting the organ and also for part to be a Vestry. The actual year of moving is unclear at present, but seems to be 1896 when Brindley and Foster rebuilt the organ and a new oak case was given by a relative of the Laughton family. In 1937 the decision was made to move the organ to its present position on the South side of the chancel. The blower was electrified at this time. As the Centenary of the instrument passed it was evident that the organ needed a radical overhaul. The action was especially unreliable. In 1965 the firm of J. W. Walker rebuilt the organ at a cost of £4, 409. The action was renewed, a new console was installed and a number of tonal modifications were made. The different manuals operate independent groups of pipes. The Great soundboard has almost one thousand pipes. Inside the Swell box we have a further 638 pipes. As the shutters are closed, the sound is enclosed in the box, giving an effect of diminuendo to those listening in the church. The rank of pipes called the Fifteenth, at the front of the box, was added recently. Several other ranks have either been extended or added over the last thirty years.